The Australian Army does not have a flag. The Army is, however, the protector of the Australian National Flag. 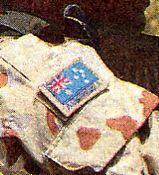 I saw a letter from an Australian Army unit in an exhibition recently, and it seems the Australian Army's badge is similar to the British one, but with a royal crown above a leaping kangaroo over the crossed swords, rather than a Royal Crest. So does the Australian Army use this badge on a red field like the British Army's flag? There are no special regulations for flag stations other than they are required to fly a large (3.6 x 1.8m) Australian National Flag on: Sundays, Australia Day, the anniversary of the Queen's accession to the Throne (6 Feb.), ANZAC Day, the anniversary of the Queen's coronation (2 June), official birthday of the Queen (as directed by Army HQ), the Queen Mother's birthday (4 Aug), Australian National Flag Day (3rd Sept), when an artillery salute is fired at a flag station, when directed by the Governor-General, on other occasions as ordered by Army HQ. Here is the current version of the Australia's Chief of Army Flag. It replaces the old Chief of General Staff flag featuring the British lion-and-crown crest (see below). Note the badge on the new flag - the Army "rising sun" and the crossed swords - is the badge of the Chief of Army. The RAAF Manual of Ceremonial, AAP 5135.002, which is downloadable at this Air Cadet Corps site, states that this flag is a car flag only. I believe it is also flown in front of the Department of Defence in Canberra. The Chief of Army flag comes in two sizes: 90cm by 180cm and 15cm by 23cm as a car flag. Use of this flag was approved by Defence Instruction (General) ADMIN 12-1 Amendment List 20 dated 24 August 2001. The emblem is the 1991 (seventh) pattern Rising Sun badge and swords in gold; the flag dimensions are 900 mm by 1800 mm. The car-flag dimensions are 150 mm by 230 mm. “Chief of the General Staff (Australia). Authorised 1/10/1992. This information does not agree with that supplied by the Australian Army in 2011. No significance has so far been found for the 1 October 1992 date, in terms of the Chief of the General Staff appointees or the flag. It may relate to the addition of the Rising Sun badge to other Army flags, but this is only speculation. The Chief of Army (formerly Chief of General Staff) flag is the Australian National Flag with the Royal Crest (crowned lion standing on crown) in full colours at the centre of the lower half of the flag. The illustration above was drawn according to Flags of All Nations [hms58], which specified it as a car flag, 6 inches by 9 inches in size. However a full-sized version in proportions of 1:2 was also known to have existed. Also, the crest in this illustration has the "King's Crown", therefore it depicts the way the flag appeared before 1952. Note that the above image shows the earlier car-flag version with imperial crowns. These changed to St Edward's crowns with Queen Elizabeth's reign. The Royal Crest design was approved at an Australian Military Board meeting on 10 May 1946, and the flags were included in the Australian Military Regulations and Orders (AMR&Os) from 27 February 1947. The personal flag was six feet by three feet and the car-flag was nine inches by six inches. The prescription was for the 'Chief of the General Staff - Flag, Blue Ensign of the Commonwealth with Royal Crest in gold embroidered on both sides'. When the flag provisions of the AMR&Os were cancelled in January 1955, a temporary authorisation AHQ A55 / 1 / 82 (A5) was made on 10 February 1955 and continued until the flags were included in the Manual of Ceremonial 1958. This manual appears to have been taken as sufficient authorisation for these and other Army flags for many years thereafter. The final approval for use of the Royal Crest flag was by Defence Instruction (General) ADMIN 12-1 Amendment List 14 dated 22 May 1990. The emblem was the Royal Crest in gold; the flag dimensions were 900 mm by 1800 mm. The car-flag dimensions were 150 mm by 230 mm. The last CGS was Lieutenant General John Sanderson with his term ending on 18 February 1997. He was appointed as the first Chief of Army on 19 February 1997, and this flag continued in use as a Chief of Army's personal flag for another four and a half years until replaced by the flag with the Rising Sun and swords badge on 24 August 2001. On 19 November 1941 in a military ceremony at the Sydney Cenotaph, General Sir Thomas Blamey was presented with a personal flag by representatives of the RSL (now the Returned & Services League of Australia). This was most likely a Commonwealth Blue Ensign with the May 1904 (third) pattern Rising Sun badge (without swords) embroidered in gold on both sides. The flag was sent to General Blamey's headquarters in the Middle East and later returned with him to Australia where it was flown at his headquarters from 5 July 1942. This or a similar flag was ceremonially lowered for the last time by Lieutenant-Colonel Daniel Dwyer at General Blamey's retirement dinner on 30 November 1945, at the Engineer-in-Chief's mess in Melbourne. There was a car-flag version of this flag, prescribed in several wartime Orders (GROs) from 1942. The final version of the Orders that dealt with car-flags (GRO A 391 / 1944) was cancelled no later than February 1947. The flag prescription was 'General Officer Commanding-in-Chief - Commonwealth Blue Ensign, with badge of Australian Military Forces in gold on both sides'. The flag measured nine inches by six inches. Earlier today (March 10) a ceremony was held in Canberra to mark to centenary of the Australian army. The colours, guidons and banners of every unit of the Army took part - the first time since the Queen's silver jubilee almost 25 years ago. The highlight of the day was the presentation of a banner to the Army by the Governor-General. The banner is scarlet, with gold fringes, cords and tassels. The obverse of the banner bears the coat-of-arms of Australia. The reverse bears the 'rising sun' badge of the Australian Army, flanked by several battle honours commemorating every major conflict the Army has involved in for the last 100 years (example: World War I). This was the first time a ceremonial banner truly representive of the Army as a whole was presented to the Army. I would guess that it's just a one-off ceremonial item, not intended to replace any of the forces' flags, or the tri-service flag. The flag is obviously in the standard British colour size of 36 x 45 inches, crimson with the Australian arms in color on the obverse and the dates "1901-2001" in gold in the upper hoist. The reverse shows the army badge--a sunburst behind a red disk bearing the royal crown--and seven campaign honors on small gold-edged scrolls: South Africa, World War I, World War II, Korea, Malaya-Borneo, South Vietnam, and Peacekeeping. The flag is trimmed with gold fringe, has gold and crimson cords and tassels, and is mounted on a pike with the usual British royal crest finial. The Times (London) has in today's edition (Saturday 24 May 2003) a photo of an Australian soldier in Iraq during a ceremony in Baghdad to mark the re-opening of the Australian diplomatic mission. Several people suggested possible reasons. Christopher Southworth and Miles Li point out that it is probably deliberate, since using the blue in the union jack is normal dark blue, so it is not due to fading, and using two shades of blue would be more expensive. Ralph Kelly suggests that the lighter shade of blue is for camouflage reasons, and Christopher Southworth confirms that the lighter blue seems to be less visible against sand. However, Joe McMillan asks why, if that were the reason, do the colours in the canton have their normal shades? Al Kirsch wonders whether it may be an Air Force Ensign, with the roundel missing possibly because the patch is too small.